You know in all those scary movies where there’s an evil king who commands a skeleton army and plans to take over the world? Usually he lives in a dark and foreboding castle in the middle of nowhere, with giant dungeons and torture rooms and a moat filled with sharks or something else terrible. Sometimes he’s undead, like a vampire or something, and sometimes he’s just a really, really bad dude. Either way, he’s got a skeleton army, and that’s intense. We couldn’t help but think, though… It must be pretty lonely if you’re an evil king and all you have is a skeleton army. If we were an evil king capable of animated piles of bones, we’d conjure up a skeleton jester too. It can’t be all doom and gloom in the castle. You’ve got to have some fun times when you’re waiting for your evil plan to finally come into fruition. 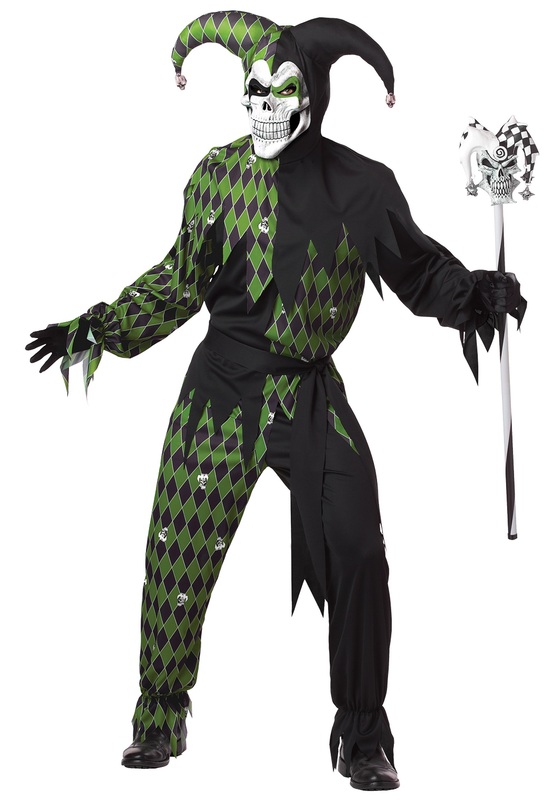 If we could conjure up a skeleton jester, we’re pretty sure he’d look something like this Scary Green Jester Men’s Costume. The shirt has a jagged hemline and is solid black on the left chest and right arm, with black-and-green diamond print on the right chest and left arm. The pants have a similar jagged hemline and are solid black on the right leg, with diamond print on the left leg. There’s also a green-and-black hood that covers the back of the whole head and comes with a large jagged-edge shawl collar with plastic skulls dangling from its points, while a molded vinyl skull mask completes the look. This is no ordinary jester… You could say his jokes are a scream!